Chicken thighs and prepared barbeque sauce cook together in a pressure cooker for a tasty filling for sandwiches. This recipe also gives a quick and easy slaw to provide a fresh and crisp condiment for the barbeque. A recipe that would normally take hours to prepare is ready to serve in under an hour by using the MultiPot Pressure Cooker. This recipe works well with either boneless, skinless chicken thighs or boneless, skinless chicken breasts. Choose your favorite prepared barbeque sauce, because that will be the dominant flavor in this family-favorite dish! Season chicken with salt and place into the inner pot of a pressure cooker; add barbeque sauce, onion, and garlic. Turn chicken to coat in sauce. Once the cooking cycle has completed allow pressure to release naturally for 5 minutes, then set steam vent to Venting to quick-release remaining pressure. Shred chicken with two forks and stir into the sauce. Allow chicken and sauce to simmer on Keep Warm until the sauce thickens, about 15 minutes. While the sauce thickens, stir the parsley, vinegar, mayonnaise, and salt together in a large bowl; add cabbage and toss to coat. 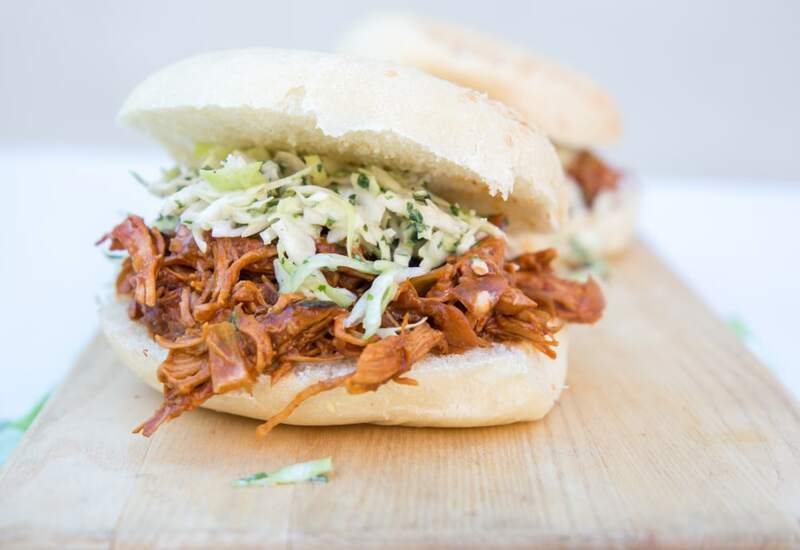 Divide the chicken between the sandwich buns; top with coleslaw and finish the sandwiches to serve. Save time by purchasing a bag of pre-shredded cabbage. A bag of broccoli slaw also works well for an additional flavor and nutritional boost! This slaw tastes great with traditional mayonnaise, reduced-fat mayo, or mayonnaise blended with olive oil. Per Serving: 812 calories; 23g fat; 90.3g carbohydrates; 62g protein; 278mg cholesterol; 2839mg sodium. Just made this for dinner for me and the boys after a day at the soccer game. Very tasty, no doubt! Ate it on crusty bread with Tim's chips. Kids put the chips IN their sandwiches. Genius! They requested this on nachos for another dinner. GENIUS! Maybe some time we will have it with steamed vegetables and try to be somewhat reasonable about our meal choices, I am sure. Thanks for the recipe! Chicken thighs were the perfect choice for this shredded chicken. The meat was tender and sopped up the sauce perfectly. This is for sure my go to barbecue chicken recipe. These sandwiches were delicious! I skipped the cole slaw and had just the barbecue chicken on slider buns, it's that delicious. My husband, on the other hand, added extra cole slaw to his. This is definitely one of our favorites. Used mayo blended with avocado oil, and it was amazing. I made bbq chicken sliders with Hawaiian sweet rolls. Made this with my husbands famous spicy bbq sauce. This is a great recipe for small get togethers. The meat comes out really tender and juicy, people will think you slow smoked it on the grill. This was pretty good but I like slow cooked chicken better. It didn’t shred very easily and it wasn’t as tender as slow cooked.